Now apparently there is a new Liu - Liu Hong Xing, the latest appointed Chinese ambassador to North Korea. New Liu. 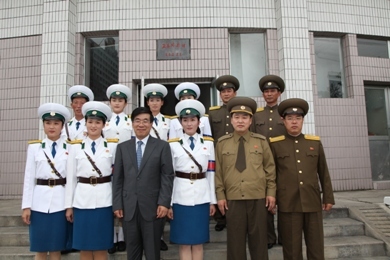 Naturally, what would an assignment to North Korea be without a meeting with the female traffic police? 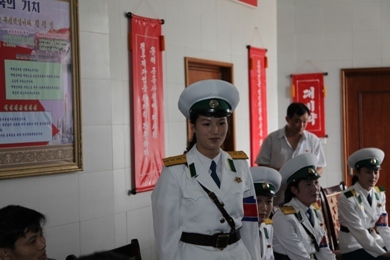 The following article is from the official Chinese embassy in North Korea website. 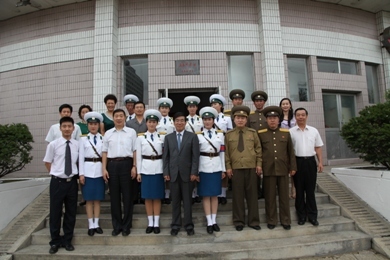 People who visited Pyongyang Pyongyang City Centre streets will be self-assured woman traffic police. Whether windy snow, sun and rain, they all stick at the crossroads, with a standard action, agile and direct the traffic. As if they bloom in the streets of Pyongyang, sonorous rose, Pyongyang became a scene. 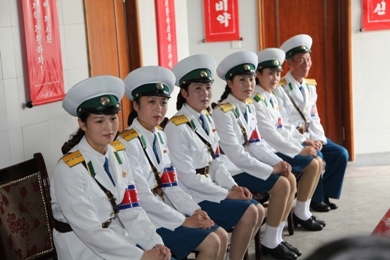 Ambassador Liu said that Pyongyang female traffic police is a beautiful city landscape, not only famous in Korea the whole country, China also has very high visibility. The comrades of the Chinese Embassy to visit the post, first to the hard work every day to maintain traffic order and safety capital, female traffic police have expressed sympathy; two outposts near the Chinese Embassy is located to the female traffic police were comrades for the embassy to provide convenience and care expressed his thanks. Li Chengzhe Secretary thanked Ambassador Liu disregard "dog day" hot to post condolences to the traffic police, this is the support and recognition of their work. Protect people's lives and safety of their comrades in the embassy duty. Xing Xing, a more than 20-year-old captain Attractively introduced post situation. The post by the six female traffic police and traffic police formed part of the male. 6 individual turns posts into two groups. Post on duty 30 minutes per class, each female traffic police post on the day in command of two hours. The post also the hero of a traffic control has five year-old male traffic police Liming Huan comrades. He several decades to serve the people wholeheartedly, is to be awarded the title of model workers, is to learn all the traffic control model. Ambassador Liu the female traffic police and asked about their work and life. Conversation, the female traffic police have said that while the work is hard, but the state on their work and life are very concerned about, give them a better deal. Winter for them with trousers, shoes, summer, sun protection umbrella to shelter them hold up. They have said that traffic police is in a glorious task, they will be hard, work hard to protect people's lives and make a greater contribution. Xing Xing traffic post in the junction, is located in Pyongyang, thoroughfares, once last year when Premier Wen Jiabao's visit through the junction, where is the center of the Chinese Embassy vehicle access must be passed through. Post female traffic police and the Chinese Embassy comrades familiar with each other, whenever the vehicle through the embassy here, the Chinese comrades will be in the car waving to the traffic police on duty women and female traffic police who will report to the will of God refreshing smile. 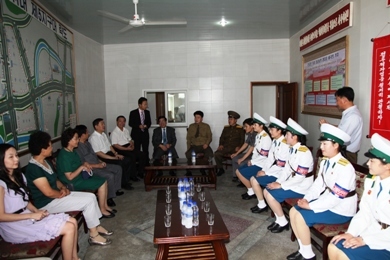 China-DPRK friendship between the peoples of the streets in Pyongyang pass each other, even more profound. Look at that guy's smile - he can hardly hold in his excitement to be with a bunch of traffic girls! Him and the PTG next to him are the only ones smiling, perhaps they have something going on. Whoot - they'll never retire the traffic girls as long as state leaders are begging to meet with them!